It has been determined in various studies that C-to-T polymorphism in the region of the IL28B gene (rs12979860) may be a marker for long-term success in Hepatitis C therapy: In contrast to patients with the T/T genotype, those who carry the C/C genotype demonstrate a significantly increased degree of sustained virological response and therefore long-term therapeutic success. Moreover, patients with the C/C genotype have a higher likelihood of spontaneous clearance of Hepatitis C virus. Hepatitis C virus infection affects approximately 170 million people worldwide. In most cases, these infections progress to a chronic disease – possible outcomes range from liver damage to hepatocellular carcinoma. The recommended standard treatment for an HCV infection consists of combination therapy with PEG-interferon-alpha and the antiviral drug ribavirin. Along with the IL28B genotype, the sccess of therapy also depends on patient compliance, the virus genotype, and the virus concentration, among other factors. 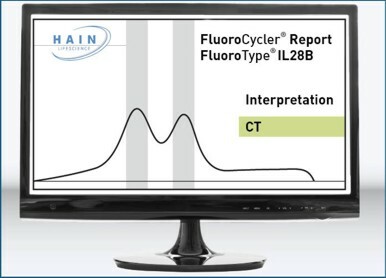 FluoroType® IL28B enables rapid and reliable detection of the various IL28B genotypes through the use of a fluorescence-marked probe. Thus a reliable IL28B diagnostics as an important component for therapeutic decisions is possible! Optimal Therapeutic Planning: Reliable detection of the IL28B genotype allows the success of antiviral HCV therapy to be determined. Innovative Technology: FluoroType® IL28B is based on an innovative fluorescence-based technology – this enables rapid and reliable results for efficient laboratory routines. 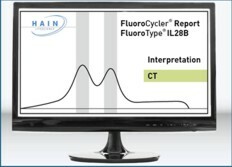 User-friendly: From amplification to detection, all steps are performed in the FluoroCycler®. Analysis and interpretation of results are then performed using test-specific software. Your diagnostics therefore become even simpler and more reliable.